Regardless of advances in technology and the beginning of a smart watch movement, a sure-fire time-piece is, well, timeless. And the designers over at Form Function Form have made that abundantly clear, pairing the Timex Weekender watch face with a handmade, Horween leather wristband. Gizmodo readers can grab this custom pairing now, which includes free shipping, the original nylon wristband, and a stainless steel case for $88. 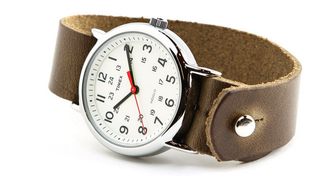 The Timex watch face is a round, silver-tone polished steel showing 24-hour time. It features Timex's famous Indiglo night-light and is water-resistant up to 30 meters. By removing the nylon and faux leather bands that normally come with it, and replacing it with one made of Horween chromexcel leather, Form Function Form takes customization to the next level. The strap is a tanned, natural espresso color and works as an adjustable button-stud band, and it's intelligently designed, hiding the holes behind the watch face. It of course fits all wrists. This watch is understated, but with Form Function Form's hand-made Horween leather strap addition, it owns the quintessential look for a classic timepiece. Get it now for $88, which includes free shipping. Seconds hand color will vary between red and black depending on stock.